Can Esther and Benji keep it together? Has the Alone Together TV show been cancelled or renewed for a third season on Freeform? The television vulture is watching all the latest cancellation and renewal news, so this page is the place to track the status of Alone Together, season three. Bookmark it, or subscribe for the latest updates. Remember, the television vulture is watching your shows. Are you? 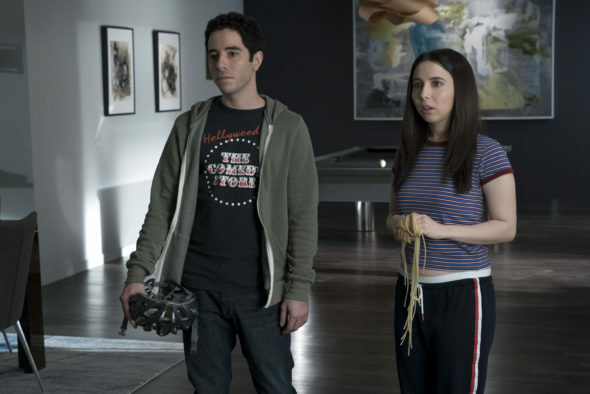 A Freeform comedy, Alone Together stars Esther Povitsky and Benji Aflalo, who created the series with Eben Russell. The sitcom centers on Esther and Benji, who stick out like sore thumbs in image-obsessed Los Angeles. Even though everyone thinks they should be a couple, they only think of each other as friends. At least they’re not all alone; they’re alone together. The second season of Alone Together averaged a 0.05 rating in the 18-49 demographic with 127,000 viewers. Compared to season one, that’s down by 53% and 44%, respectively. Learn how Alone Together stacks up against the other Freeform TV shows. Alone Together has been cancelled so there won’t be a third season. Could it be revived someday? Stay tuned for further updates. Will Freeform cancel or renew Alone Together for season three? The ratings are way down and this series is the channel’s lowest-rated series. Unless they aren’t depending on commercials revenue, this show seems destined to be cancelled. I’ll update this page with breaking developments. Subscribe for free Alone Together cancellation or renewal alerts. 11/5/18 update: Freeform has cancelled their Alone Together TV show so there won’t be a third season. Details here. TV show ratings are still important. Follow Alone Together‘s weekly ups and downs. Find more Alone Together TV series news or other Freeform TV show news. What do you think? Were you hoping that the Alone Together TV show would be renewed for season three? Are you sorry that Freeform cancelled this TV series, instead? More about: Alone Together, Alone Together: canceled or renewed?, Alone Together: ratings, Freeform TV shows: canceled or renewed? I didn’t expect to like this show when my friend introduced it to me but it’s hilarious. I love that their relationship is platonic and shows no signs of changing; it’s a lot more interesting than the typical romcom with the hackneyed odd couple story. I really hope they return with season 3, I’ll be so sad if session 2 is the end. Alone Together is a wonderful show. I sure would miss it if it were cancelled. I wish the show had more publicity.